Regular weekend readers likely recognize this rust free and original 1970 International Scout 800A from Found off the Street, our weekly look at old cars lurking around the cape that rust remembered, Cape Cod, Ma. An original and rust free Scout is hard to find anywhere, especially coastal New England. Because of this an original Scout like this a very rare sight. One interesting and previously unknown fact about this Scout is that it has traveled only 26,000 miles in its life. The low mileage explains a lot about the excellent condition of this Scout. Also of note and not mentioned in the Scout's Found off the Street appearance is the fact this 800A has the somewhat rare AMC 232ci straight six engine that was first introduced in 1969. The engine never really caught on in the 800s or Scout IIs, despite its smaller size the engine offered very little improvement in fuel economy. Even though the seller points out in the advertisement the Scout is ready to restore, for my standards this old IH would need little more than a top removal to enjoy the summer. Of course these statements are made with no knowledge of the mechanical condition of the truck beyond the seller's description of "runs good". 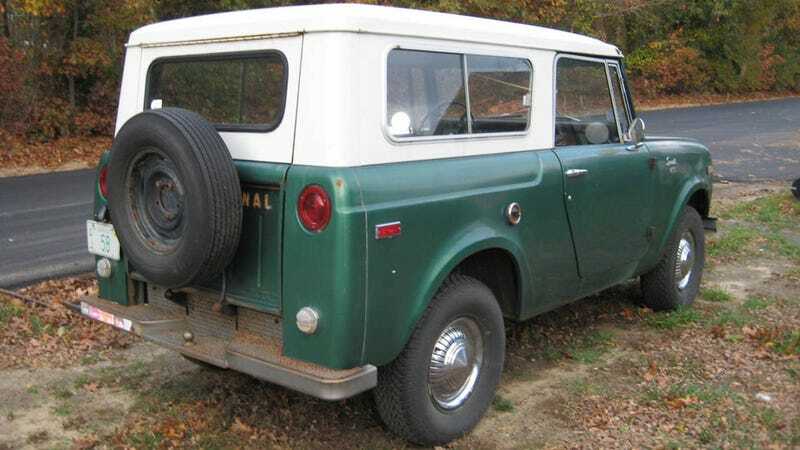 If you are in the market for a clean old scout this former FOTS subject has been bid to $6600 without meeting reserve. If I didn't already have an old IH I love, this survivor would be very tempting. Even if it doesn't stay on the cape that rust remembered, I hope the Scout that rust forgot finds a good home when the auction ends today.